I've tried at least 14 different OSes (all *nix) on this great little machine and the latest one is Arch Linux (2009-08). As I reported a couple of posts ago, I managed to make this experience quite unnecessarily painful by a very silly and careless error. But once I was over that, it was almost plain sailing. I say "almost" as I find that shutting down (or rebooting from) Arch frequently leads to an unbootable (or refusal to boot) situation. When this happens, I unplug the power cable, take out the battery, hold the power button down for 20-30 seconds and then replace the battery and power cable and boot. Unfortunately, this often leads to a need to run "# fsck -y /dev/sdXY" due to the unclean unmount. On one occasion, the fs got so badly messed up by this that I had to reinstall Arch all over again. Now that I've got everything working again, I just hope this behavior is not going to be a feature of Arch on the 901. Unknown username "root" in message bus configuration file. Could not get password database information for UID of current process. User "???" unknown or no memory to allocate password entry. Failed to start message bus: Could not get UID and GID for username "dbus". After these messages had appeared about 10 times, then boot tried to start HAL but hung at this point leading to a need to resort to me having to hold the power button down until it shutdown. And it didn't always shutdown which is why I had to whip out the battery. Note that Arch has a really great wiki where everything you need to complete your setup is presented in great detail. 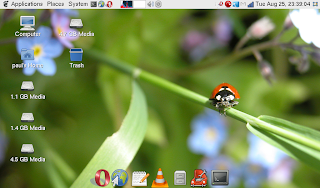 After booting to the "gnomified" Arch, I was easily able to get Opera 10 Beta3 (need to install Qt3 for this), compiz-fusion and CheckGmail installed with ease. Be aware that Arch uses the Vesa video driver for everything and this won't handle 3D effects on the 901. So you need to find your driver and install it. For me this was xf86-video-intel. However, I was particularly happy to be able to get Kiba-Dock installed and working very well in Arch. It certainly works an awful lot better here than it did in Zenwalks xfce. 1. Download the Kiba-Dock deb from here (you'll need to login to Ubuntu forums to access the download). 4. Use chown to change owner of the .tgz from root to user if necessary. 6. Go to ~ and create directories ".kiba-dock/profiles"
11. Place the command "kiba-systray.py" in the Startup Applications and reboot. Assuming you have compositing (3D effects) working you should now have the ability to start dropping apps into your new Kiba-Dock. Here's a screenshot of my Desktop with the Kiba-Dock at the bottom.